The Championship North Two title-winners extended their 100 per cent record this term with a 68-7 demolition of the Midlands division champions at Newark RUFC. Sunday's Championship North promotion play-off was a fairly one-sided affair, with 'Gate setting the tone right from the word go. Lucy Barnett's team managed to gain possession from their own kick-off, with captain Rose Jay leading from the front. This led to an early try for centre Sarah Foster, who ran hard through the Bletchley defence and touched down between the sticks. A second score was to follow just moments later when Lauren Bolger went over, Alex Wallace converting for 12-0 inside five minutes. A spell of Bletchley pressure followed with 'Gate temporarily reduced to 14 players following a high-tackle, though a Nieve Jones turnover ended any opposition hopes of a breakthrough. The ball then made its way into the hands of Jay, who produced a fine dummy that took her past three defenders before she dived over the whitewash and Wallace kicked the extras for 19-0. Some neat handling in the backs then released Bolger, who ran three-quarters of the length of the pitch to register her team's fourth try, again converted by Wallace. Bletchley again showed some signs of life until a poorly-executed clearance kick landed right in the hands of winger Sophie Wilson and she outpaced her opposite number and finished off to make the score 31-0. A couple of injuries then forced 'Gate into a re-shuffle and the Midlands outfit took full advantage, grabbing a converted try of their own to reduce the deficit to 31-7 at half-time. That was as good as it got for Bletchley, however, as Barnett's side began the second period with intent, drawing first blood when Achele Agada stormed over following good work by her fellow forwards. The next try was executed beautifully by the backs. Jay kicked from the centre, Bolger picked up and offloaded in the tackle to Wallace, who slid over the try-line to register a fine one-handed effort and increase the lead to 41-7. Despite receiving a second yellow card, 'Gate remained in the ascendancy and progress made by Annie Lyles, Jay, Foster and youngster Izzy Harris ended with Bolger completing her hat-trick. From the re-start, Harris and Bolger linked up nicely once again and the latter stretched her side's advantage to 44 points at 51-7. Wilson, Jay and Bolger then created an opening that was finished off by Wallace in the 70th minute. Number eight Amber Barnicoat was next to get in on the act, picking the ball up inside the Bletchley 22 and using her strength to power through a number of would-be tacklers. The final score of the match stemmed from Harris' initial break, Charlotte Warriner carrying the move on before offloading to Jay, who set up Wallace to grab her third of the day. 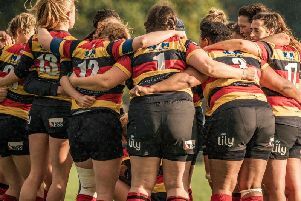 Harrogate Ladies have one fixture remaining this term and will be looking to complete both a perfect season and a league and cup double when they tackle Old Albanians this Sunday. The final of the National Intermediate Cup kicks-off at 4.30pm at Derby RUFC. Supporters welcome.